Downside protection is particularly relevant today as volatility is expected to increase in emerging markets. Whether it’s the impact of rising rates in the U.S., escalating U.S.-China trade tensions or political turmoil in Turkey or Brazil, a quality growth approach can help navigate uncertainty and uncover the return potential held within the planet’s most dynamic economic area. With decades of experience investing in emerging markets equities, our team seeks to invest in quality growth companies that can consistently and predictably grow earnings year in and year out. By delivering in both good and difficult environments, we seek to outperform the market with less risk over time. Join us for an interactive webinar with Sudhir Roc-Sennett of the Quality Growth boutique research team. Sudhir will discuss his approach to sustainable investing in emerging markets and why ESG considerations are integral to the Quality Growth approach. Victor Schraner, Relationship Manager, will moderate a Q&A with Sudhir. Inefficiencies are prolific in the emerging corporate bond space, making it an active manager’s paradise. In this webinar, Wouter Van Overfelt, Senior Portfolio Manager, will explain how to take advantage of these inefficiencies by complementing tried and tested value-driven strategies with event-driven opportunities. -Why he actively seeks stories which other managers avoid. -Where he is finding value in the current market. -What his views are on recent market developments. Fixed income investors globally face a huge challenge defending returns against rising rates and resurgent volatility. Central banks are on the path to policy normalisation and in all likelihood the low yields of this cycle are now behind us, while bond market volatility has returned with a vengeance in 2018 as markets struggle to navigate an increasingly unpredictable geopolitical climate. 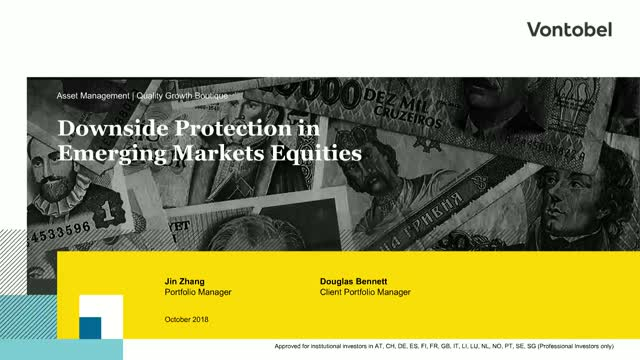 In this webinar, TwentyFour Asset Management partner and portfolio manager Chris Bowie shows that even within the fixed rate investment grade bond market, there is a mix of assets that can offer protection against these challenging conditions without giving up the potential for absolute returns. As investors, millennials usually are “sustainials”. They keep an eye on the positive environmental impact of their portfolio holdings as well as on financial returns. But they need to separate the wheat from the chaff. For instance, what’s the correct way of measuring carbon emissions? Either you apply the backward-looking CO2 footprint method, or you look ahead, using the less-known concept of “avoided CO2-emissions” instead. -Why in addition to a company's ability to maintain its current dividend, it’s also important to consider whether it may be able to increase its dividend over time. Income continues to be a scarce commodity in financial markets. Fixed income remains the most natural place to look but finding value can be a challenge in the current market environment. Where do you look for safe yield whilst rates are going up? A new digital reality is changing the world when it comes to fixed-income investing by suppressing pricing power, wage inflation and spending growth – these changes will require lower rates for longer. This raises the question: Can income still be found in the world of fixed income? 2017 was a year to remember. U.S. equity markets reached new all-time highs, the Eurozone gathered steam amid a broad-based recovery and emerging markets rallied on improving fundamentals and economic reforms – and volatility hovered at historic lows. Join our webinar where CIO Matthew Benkendorf will share his thoughts on what’s in store for 2018. Andrew Raisman, Head of Quality Growth Sales EMEA, will moderate a live Q&A with Matt. The U.S. equity market is in its ninth year of a bull run and some investors are concerned that a correction is looming. While market conditions are generally favorable, there are some fundamental pressures that could impact volatility over the short term, such as rising rates in the U.S. We believe the best way to navigate a potentially tricky market is to take a bottom-up approach and invest in “quality” companies with consistent and resilient earnings growth. In this interactive webinar, Matthew Benkendorf, Chief Investment Officer and Lead Portfolio Manager, discusses why an active, high quality approach to US equities can lead to competitive returns with lower risk than the index over a full market cycle. Emerging market corporate bonds are thriving, offering considerable pick up compared to emerging sovereigns and developed market equivalents… but with considerably less leverage and lower duration. Certain segments of the market can also be highly decorrelated from the broader markets because price action tends to be corporate specific. Join us for an interactive webinar where Wouter Van Overfelt and Sergey Goncharov will reveal how our signature value strategies, combined with our contrarian approach to special situations (which other managers often avoid) can help you extract alpha from emerging market corporate bonds. •Why emerging market growth is outpacing developed markets? •Where to find returns in the diverse emerging market bond universe? •How relative-value trades can boost portfolio performance?